In our last post we created a reservation to limit the resources that our business group can use for service deployments. But before we get into building services, we want to create a custom group that will allow the tenant administrator to regulate who has permissions to do certain tasks within that tenant. 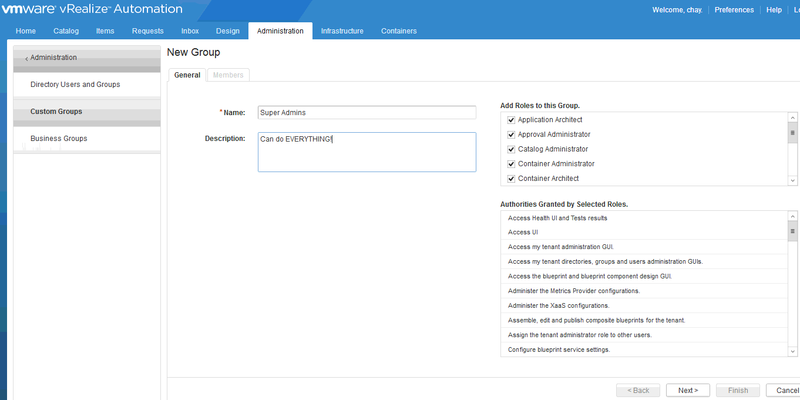 This is really helpful in a enterprise environment when there may be many people with different roles within a organization and not everyone needs access to do everything within vRA. Enter a name for the group. In the “Add Roles to this Group” box, select the roles that you want to assign to the group. As you select each role, you can see what users assigned this role will be allowed to do by looking in the “Authorities Granted by Selected Roles” box. I am creating a Super Admin group, so I will select all the roles. Click “Next”. Now that the group is created, logout and log back in for the permission to take effect. Depend on what role a user was assigned, it will affect what tabs they will see. That’s one way to know if your roles were assigned properly or not. That’s it! Now that we have our custom group created and the design tab available to us, we can began designing blueprints and creating services.